Classic Harbor Line: Known as the boutique of New York Harbor yachts, boasts a small fleet of turn-of-the-century style boats. Each is known for their quality craftsmanship, and their intimate, elegant and comfortable environments. From the Schooners’ beautiful sails and construction, to the Manhattan’s luxurious old-world nods, there is a yacht for every taste and style. Each yacht was handcrafted here in the State of New York, along the Hudson River. Made with great detail and pride, each vessel features teak decks, mahogany trim and a number of brass fittings and well-appointed fixtures. These beautiful boats are ideal for weddings, entertaining, and hosting family or friends for a number of beautifully memorable occasions! 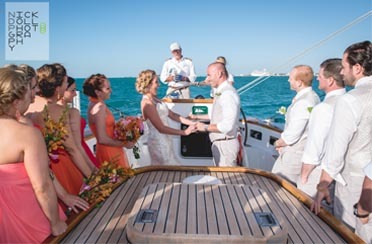 Book your Nautical Wedding on any of our Yachts! 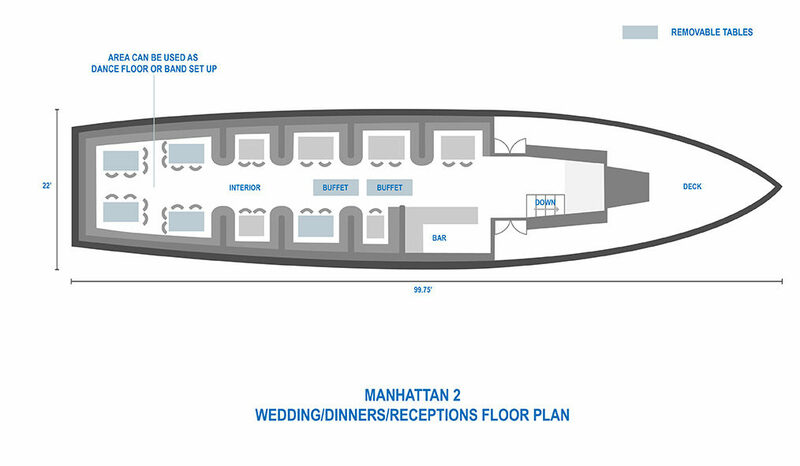 Click here to view a floor plan of the vessel. Say, “I DO!” while taking in the Statue of Liberty, the Brooklyn Bridge, the Empire State Building, and the Chrysler Building. Let New York City’s iconic skyline act as a perfect backdrop on your perfect day! We also have Captains that are available to be your Officiant! If you are planning a Fall Wedding, you may want to take advantage of our west side location and take a north bound route on the Hudson to experience the famous Fall Foliage of the Palisades along the Hudson River. Treat your day-after friends and family to our famous Around Manhattan Brunch or Around Manhattan Afternoon Tea. If they haven’t had time to see the sights, this relaxing, intimate, private brunch or afternoon of tea covers all the bases while you get to say ‘Thank You’ and ‘Good Bye’. Guests sit back and relax with an open buffet and bar service. 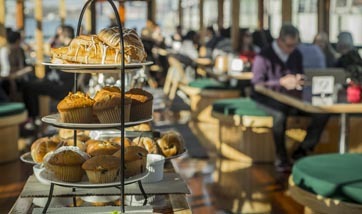 Both our brunch and tea menus are chocked full of local items from New York City and New York state food purveyors. Your guests will truly experience a “Taste of New York” featuring New York State cheeses, teas from the Chelsea T Salon, and renowned local bakeries. You can fully circumnavigate the Island of Manhattan during Brunch or ‘Tea’ from the elegant glassed-in observatory of the Manhattan. This climate-controlled space makes this venue a perfect environment to host your brunch reception during the Spring, Summer, Fall, or Winter. Complete your wedding with an elegant, comfortable and classic reception on our 1920s style motor yacht, Yachts Manhattan and Manhattan II. Treat your friends and family to the classiest yachts in town as you cruise around Manhattan! Our yachts are the only New York City Yacht of their caliber that can smoothly circumnavigate the entire island of Manhattan — passing underneath all 18 bridges! Full Dinners can serve up to 80 guests, and passed hors d’ oeuvres receptions can accommodate 110. The Manhattan is an ideal venue to host the traditional bridal shower! She is great for smaller, elegant, and memorable gatherings. Its spectacular glass observatory has plenty of cushioned seating and hand-crafted wooden mahogany tables to display your gifts and flower arrangements. 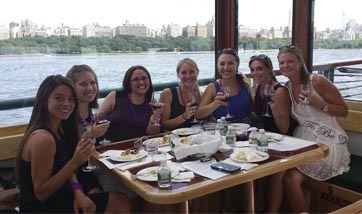 What better place to host your friend’s bachelor or bachelorette party than with Classic Harbor Line! These vessels offer an elegant way to go down memory lane and celebrate the future on the horizon! You will be away from the sounds of New York City and have a peaceful time to reflect on the past and take in the thoughts of the future. 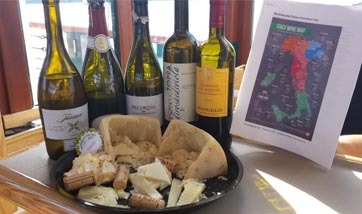 Circumnavigate the Island, or add a wine tasting to your night out! Dance the night away or sit back and relax while chatting with you your closest friends and family! Sail or Cruise past the Statue of Liberty, Ellis Island, Governors Island, and the Financial District. Pass under the Brooklyn Bridge, Manhattan Bridge, and the George Washington Bridge! 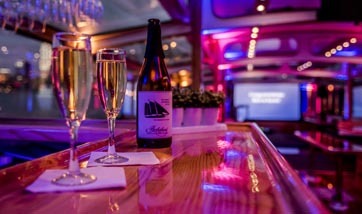 Whether you decide to sail the day away or cruise into the sunset, this is a great, elegant, and original idea for a Bachelor or Bachelorette party. Only in New York! 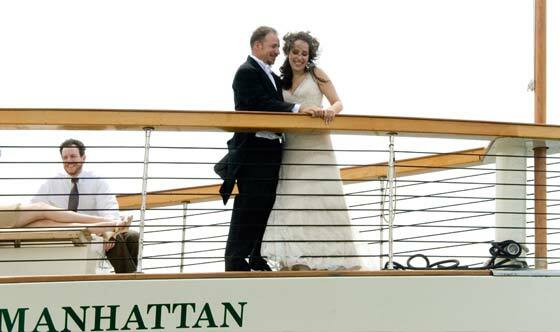 Hop aboard our 1920’s-style yacht, the Manhattan, and host your Rehearsal Dinner in style! 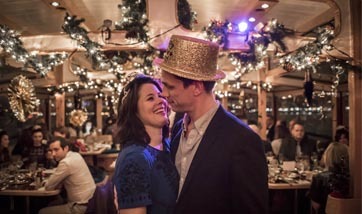 Take to the New York Harbor and let your guests experience the thrill of seeing the iconic New York City waterfront sights, while reveling in the excitement of this pre-wedding tradition! Let our famously-friendly crew take care of you and pamper your closest friends and family while sipping on champagne and enjoying a ‘local’-inspired menu for dinner or a passed hors d’oeuvres sampling by our in-house chef. The Manhattan can accommodate up to 75 guests for passed hors d’oeuvres, up to 50 for a dinner (buffet service), and for smaller party’s of 25 or less, plated dinners are available. To make this gathering ‘pop’, you should know that we are experienced at hosting a number of Themed Cruises: Our in-house food and wine expert can design and host a wine tasting dedicated to the guest of honor; inquire about our Morimoto Sushi and Sake Sail; or make use of one of our many local brewery partners for a NY State Beer and Cheese Pairing Sail.